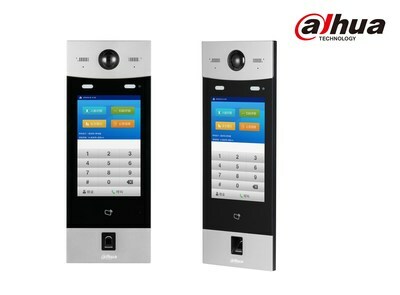 HANGZHOU, China, Oct. 11, 2018 /CNW/ -- Dahua Technology, a leading solution provider in the global video surveillance industry, has launched a new apartment outdoor station VTO9341D, providing new access control solutions to fence and lobby entrance with the cutting-edge face recognition technology. The apartment outdoor station elevates the safety and convenience of resident security system to a new level with the fashionable non-touch face-recognition entry, while conventional unlocking ways are preserved in case of emergency. The product's working temperature is between -20°C to 60°C, meaning it can operate smoothly across a variety of weather conditions and geographical areas. With a shell made of aluminum alloy plate, it meets IP55 standard for water and dust resistance, and IK07 standard for impact resistance. Further enhanced by the Intrusion Prevention System, the product will offer ideal ingress protection to property owners and faciltate the work of security guards. Once a person steps into the 0.5-metre distance within VTO9341D that triggers its approaching induction, the 2MP CMOS image sensor will capture the face in high-definition color image for identification. In as quick as 0.5 second, it can complete recognition and open the door for the residents. With strong capacity to store up to 20000 faces, the system would suffice the demand of large housing estates or commercial lots. The Auto Gain Control supplements white light to cope with poorly-lighted conditions, enabling night vision for the outdoor station. VTO9341D is also equipped with Mifare Card reader, fingerprint recognition (with a memory of 3000 fingerprints), and touch screen key pad, which provide multiple unlocking approaches via card, fingerprint and password. Working together with VTS5240B Master Station that can forward image to mobile devices, owners can even enjoy the remote unlock function while away from home. Additionally, the audio system supports bidirectional talk, which assists visitors and owners in dual-way communication as an auxiliary to face identification. As a high-end product with unique features and full market potential, VTO9341D will benefit both Dahua dealers and system integrators. With DSS EXPRESS monitoring access control & other Dahua exclusive technologies, the apartment outdoor station would lower the time cost of integration and maintenance. With a mission of "Enabling a safer society and smarter living", Dahua Technology will continue to focus on "Innovation, Quality and Service" to serve partners and customers around the world.